As import-export manager at Melon Exporters S.A. (fictitious name), I had a lot to learn about the fresh fruit market. Selling high quality fruits on the overseas markets required much more than a good and bountiful harvest. Questions raised by a large prospective European client, scheduled to visit our Head Office and melon farm, left me flabbergasted. I passed on the news received from our commercial director in Rotterdam to the owner and president of Melon Exporters S.A.
“They can come and see,” he told me, unperturbed. When I first joined the company, I visited the farm and met the farm manager, agronomists, and other personnel with whom I maintained daily contact. 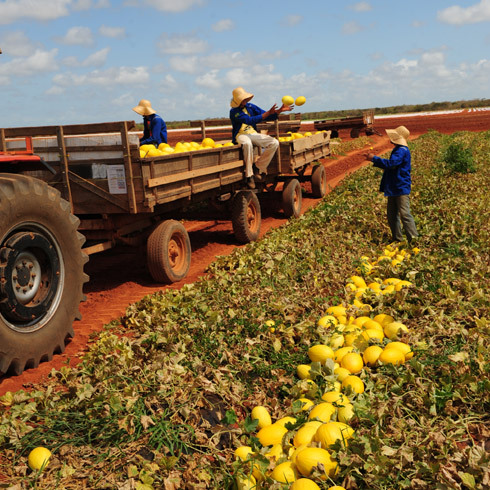 As producers and exporters of fresh melons, our farm operations and working conditions had to comply with Brazilian government requirements and international standards for fresh fruit exports. Before signing a purchasing contract with our company, two executives from the European company, accompanied by our commercial director, arrived in Fortaleza, capital of the State of Ceará, on a three-day visit. On their visit to our melon farm, over 92 miles away, the commercial director invited me to join the inspection party. At the farm, in the bungalow-style administrative building, our European guests met our farm manager and other administrative staff. Within the administrative compound, a similar building housed the kitchen and dining hall. They had the opportunity to visit the kitchen and to partake of the meal prepared for all administrative and field workers. After lunch, we visited the nursery, fruit processing division, and packing plant. Our guests inspected the toilet facilities provided for the field and other farm workers. They recommended the use of antibacterial liquid soap instead of the bar soap provided. During the inspection of our fruit processing and packing divisions, I paid keen attention to the questions our guests raised and responses made by our farm personnel. Later, the farm manager and agronomist, in two separate open jeeps, drove us through the melon plantation extending for miles across the flat open landscape. We stopped several times in the field to allow our guests to examine the melons under cultivation. It was a great stride forward for Melon Exporters S.A. when the European company signed a lucrative export sales contract with us. That visit and subsequent sales contract taught me the importance of going a step further in meeting a client’s sanitary requirements. I had a lot to learn about the invisible barriers to succeeding in the international fresh fruit market. Learn about the WTO Agreement on the Application of Sanitary & Phytosanitary Measures (SPS Agreement) at http://www.wto.org/english/tratop_e/sps_e/spsagr_e.htm. Thanks for sharing my article on your blog, Cyril. Any antibacterial soap is BAD for the earth, it does NOT break down in the enviroment, it also causes a lot of problems for PLANTS, BIRDS, ANIMALS and INSECTS. Thanks for raising this issue, Bernard. In the nineties, when the European client made this recommendation, we were not yet aware of the dangers of antibacterial soap. Sanitary and phytosanitary requirements for the handling and processing of fresh food products can be very rigorous for producers and exporters, making it difficult to enter certain overseas markets. I would add that they MUST be rigorous for the sakes of the consumers as well as those working for the exporters. Unfortunately, as noted by Mr. Singh, we tend to jump at solutions as long as they are new and sound reasonable despite the lack of evidence. I agree with you, Angela. Moreover, our tendency “to jump at solutions” can present yet another challenge for fresh food producers and exporters.